L picks me up from work at 1.30 as I have the afternoon off for the unhappy occasion of the funeral of L's mother's sister at Bretby Crematorium. Which is somewhere near Burton. After the service a few nibbles are served locally at a place that seems to specialise in post-funeral entertainment and not much else. It certainly doesn’t have any beer which is probably no bad thing. We save ourselves for later on both the beer and food fronts, forsaking the buffet in favour of the traditional Friday Thai Curry. Later arrives earlier than expected on the beer front as we nip for a cheeky pint of Damson Porter at the Devonshire Arms. As we’re in Burton, it would be rude not to. 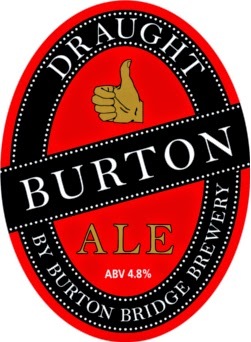 It is also my first chance to try a half of the new Draught Burton Ale. This was a beer that was one of the few real ales around locally when I started drinking but it was axed recently by its current owners Carlsberg. This is not an official version but a new version brewed by the Burton Bridge Brewery, who should know what they are doing because two of their directors were involved in the development of the original brew at Ind Coope back in the day. You what, it’s not bad at all. Then it's a post funeral Friday night, I'm not sure if that's the done thing or not.